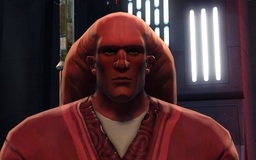 Nu’ro was a Twi’lek with bright red skin he was born in 45 BBY on Coruscant His Father was a Lieutenant in the Republic Army and His Mother was the Senator from Ryloth. When he was 16 he entered Boot Camp for the Republic Army when he was 18 he joined Rancor Squad and he rose though the ranks quickly by 23 BBY he had Reached the Rank of Captain. During the Clone war he fought beside Rahm Kota once and he fought on Mygeeto before the Clones and showed up and he fought at First Battle of Geonosis and two moths after that he fought at First Battle of Kamino but then his squad never really saw battles the Senate choose to use the clones as the front line troops and only use the Republic Army when the clones failed. One month after Palpatine created the Galactic Empire Rancor Squad was disbanned when asked why he was told “We have the clones and we don’t need the Republic Army anymore.” Nu’ro was beyond Angry at this he had spent years severing the Republic and they throw him out like that. He then bought a old XS stock light freighter that had been heavily modified to be up-to-date. He then did a few jobs for nobles to earn some quick cash but nothing Illegal.